This Monday, I feel emptiness as I am missing my soccer games. Now I am having withdrawal symptoms, missing those busy afternoon and evening plays. Finally Germany becomes the world champions. You can call me a crazy soccer fan. I have to wait for another 4 years to get to see world cup. Today is 15th July; the reveal date of “Baking Partner’s challenge”. Finally to meet the deadline I geared up and made this berry shortcake yesterday evening. This month challenge was suggested by Reeni of Cinnamon Spice and Everything Nice. It is also my first encounter with the shortcake; it is made with all purpose flour, cornstarch, baking powder, salt and cream. I mixed everything together and then the dough is made and cut it into 2 ¼ inch rounds which is dipped into melted butter and baked in oven until golden brown. It is then served by slicing them into two pieces and then sandwiched with sweetened whipped cream, macerated berries both in middle and top. It is delicious. If you are scone or a biscuit fan you will love it. I made berry shortcake with both strawberry and blueberry. This Friday while shopping at Sam’s club I spotted a box fresh strawberries, which is ultimate weakness for me so bought them immediately. With half of strawberries I made strawberry ice cream. And rest I used for this strawberry shortcake. 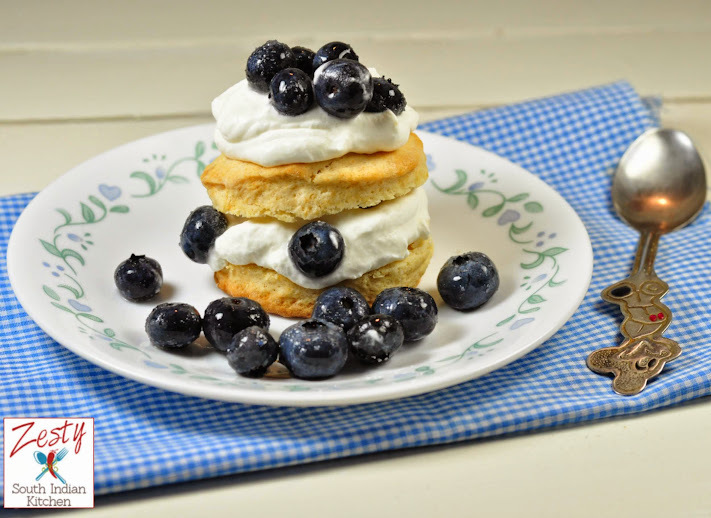 I have blueberries too in my hand, so decide to make shortcake with them too. There is also a kid’s cartoon character called strawberry shortcake, If you ask me which berry shortcake you like it I will say both. Strawberry shortcake is more beautiful compared to blueberries, but taste wise both are delicious. Next time when you are planning a party tries to make this berry shortcake. Even though it is named as shortcake it is biscuit. 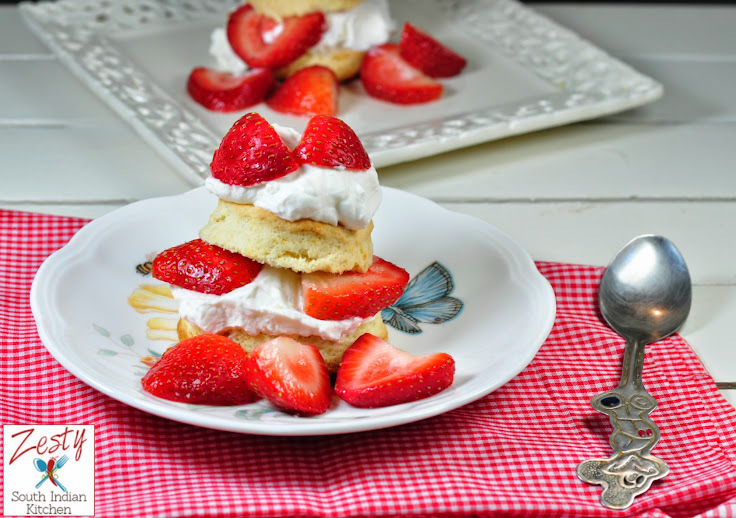 Berry shortcake is old time classic. When you get fresh berries, try it especially during summer months where berries are abundant. It is perfect treat for backyard barbeque of any informal family gatherings. Here comes the recipe. It is also very easy recipe; you only need 2 hours to make this delight. Please visit rest of baking partner’s creation too. If you want to bake with us next month please shoot me an e-mail at favoritesrecipes12(at)gmail(dot)com. 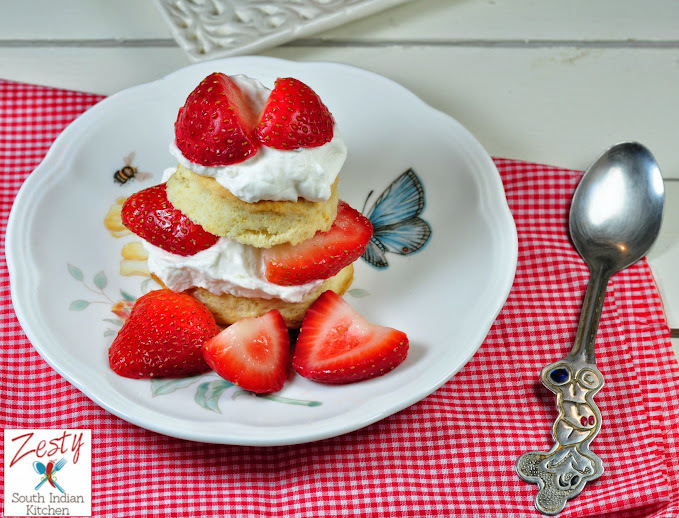 Delicious shortcake with Chantilly cream and fresh strawberries and blueberries. In a bowl toss the blueberries with 1 tablespoons of sugar to let some of the juices come out. Similarly in another bowl add sliced strawberries and 1 tablespoon sugar and cover and refrigerate. Preheat the oven to 425 degrees F. Fit a large baking sheet with a silpat mat or parchment paper. Into a medium mixing bowl sift together the flour, salt, baking powder, and 2 teaspoons sugar. Stir in enough heavy cream to moisten the dough thoroughly. When you squeeze the dough it should stay together without any dry pieces falling off. Turn the dough out onto a lightly floured work surface and very gently pat it or roll it into an 8" circle about 3/4" thick. Use a sharp biscuit cutter ( 2 + 1/4-inch) to cut into rounds. Combine the scraps and roll out again until you get 14 rounds. Dip the rounds into melted butter, and place them on the prepared baking sheet. Sprinkle them generously with coarse sugar. Bake the biscuits for 15 to 18 minutes until they're golden brown and puffy. Meanwhile make the whipped cream. he bowl of a stand mixer or in a large mixing bowl beat the whipping cream with 2 teaspoons sugar and 1/2 teaspoon vanilla extract on medium-high speed until thick and stiff. When you lift the beater the cream should stick to it without falling off. and the juice, more cream, the top biscuit, more whip cream and a few more berries. H ahaaa withdrawal symptoms …my daughter is so happy that her dad will be finally free on weekend. Shortbread looks yummy . Ideal for summer. Cake looks sweet and yummy……. Lovely !! Oh Swathi!! I feel it!! Missing football oops Soccer 😉 Which team u were you cheering for this time? And berry shortcake looks delicious!!! Yes Melissa that will be wonderful you can mix it. these look wonderful I guess you could watch the premier league ? Both look beautiful and I imagine the taste. Sorry about listening that you misss the matches. Not me, at home, I have two terrible fans. 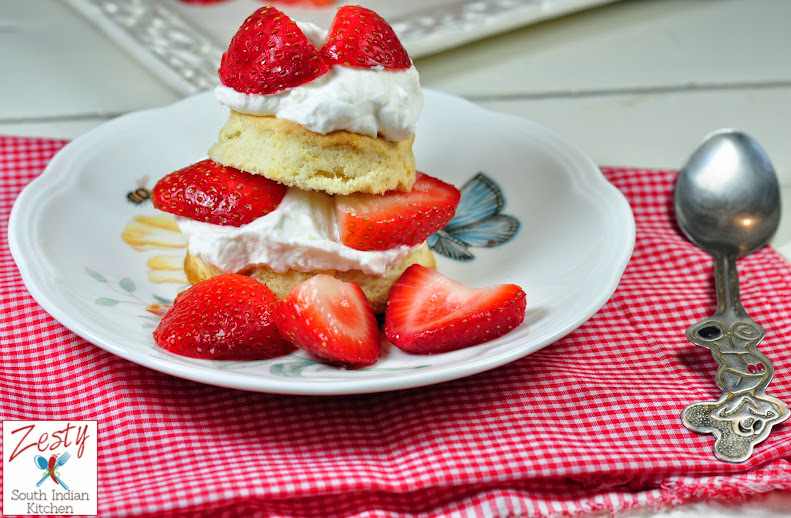 I am in complete love with your shortcakes! But yes, I totally understand the withdrawal, it actually hurts! delicious shortcakes n we enjoyed the challenge to core!!!! 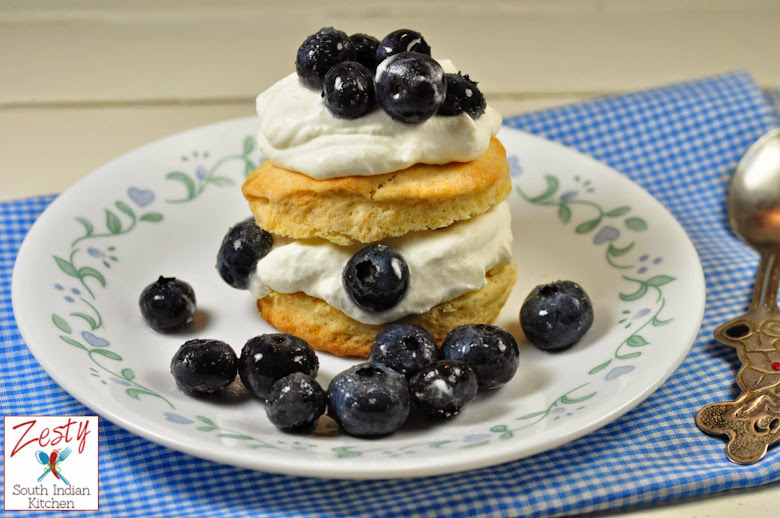 Heavenly cookies with cream and berries…love the way you started your blog…hats off to you Swathi Iyer…. Looks very tempting and delicious, love to taste some now..
cake looks so cute and yummy.